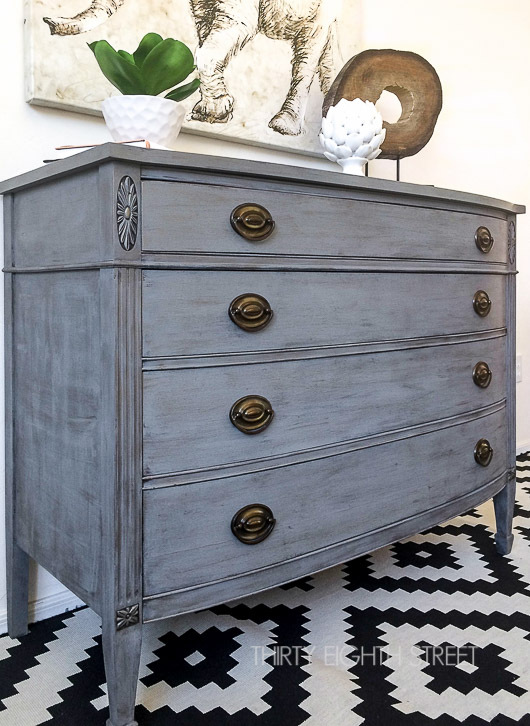 We love this faux paint finish so much we're adding it to our awesome layering paint resource page! 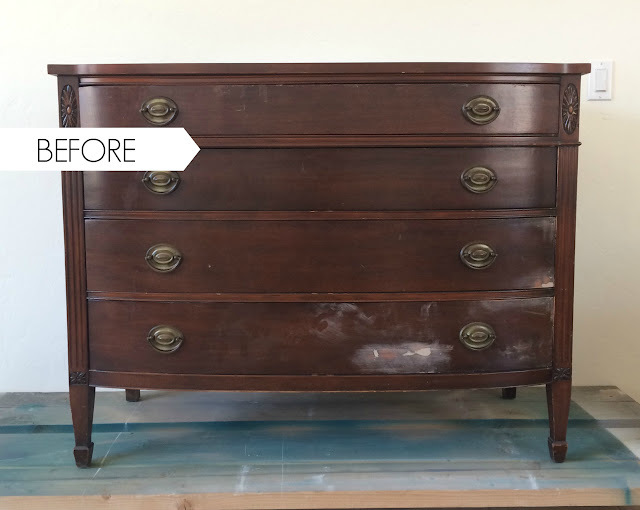 Learn how to create an easy DIY Restoration Hardware faux finish for your own furniture. 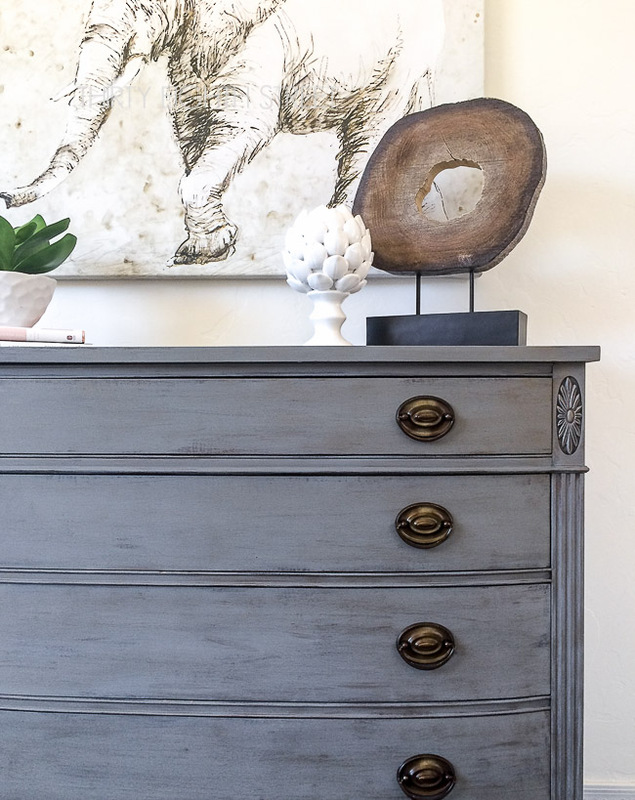 Our step by step tutorial walks you through how to layer and dry brush metallic paint onto your furniture to create your own layered zinc finish that will fool even the choosiest of friends! Save yourself some big money and create your own Restoration Hardware knock off! I'm not willing to pay several hundred dollars or even a $1000 for a piece of furniture from Restoration Hardware. Unless I need a new sofa or mattress, the thought of paying an inflated sticker price for brand new furniture makes me ill. But, just because I'm not willing to spend a lot of money on furniture doesn't mean that I don't want the look of high end furniture in my home! What if you could have both?! 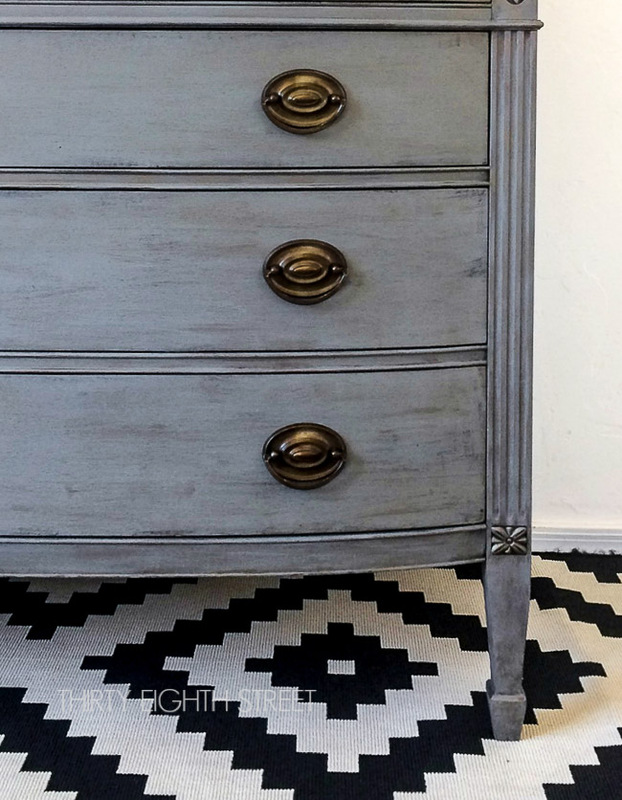 In just a few simple steps you can re-create a budget friendly Restoration Hardware look alike using a wonderful product from Country Chic Paint called Metallic Accent Cream. Overall this chest of drawers was in pretty good condition. The dresser had some peeling veneer and a few gouges that need to be filled and sanded but other then that it was a solid piece with great bones. .... to THIS! What a transformation, right!? Keep reading to see how we did it! Step 1: Prep your piece and fix any cosmetic damage. Make sure your piece is free from dust, dirt and grime. Remove the hard ware. I love to use Murphy's Wood Cleaner to clean the furniture before I paint it. *(Krud Kutter, TSP, or Mineral Spirits works great too! Step 2: Apply a thin coat of Cobblestone paint. 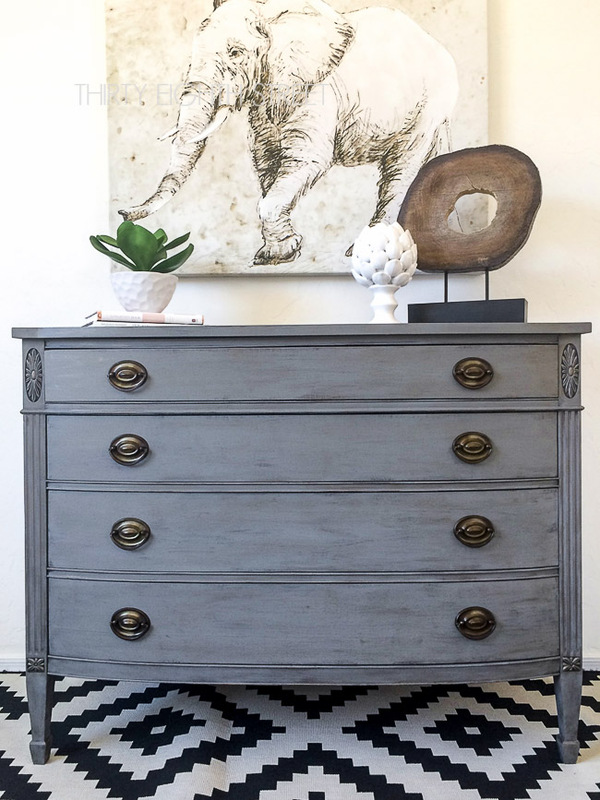 The first step in achieving a Restoration Hardware faux finish is to apply a thin coat of grey paint. To achieve this look, you do NOT want full paint coverage. You want the rich dark wood to peak/show through underneath the grey. Step 3: Apply a second light coat in random areas. The next step to getting that pretty layered zinc finish is to apply a second light paint coat to random areas all over your furniture. Again, you're not going for a full saturated color. You want the rich dark wood to peak through underneath the grey. You also want to be sure that you're applying the second coat in random strokes going in different directions (see below picture). This gives the appearance of layers and a natural distressing without having to go back and actually distress. Hint: Dip your paint brush so there's just a small amount of paint on the brush. Brush in random strokes and in different directions for your second coat. This gives the illusion that there's texture. You should get a light feathery look vs a solid streak. (Picture Example) Take a peak of the above close up shot. This was taken after two coats of paint. Here you can see the original wood peaking through the Cobblestone paint. Look closely and you can see the directional paint strokes. You'll also see a faint shimmer of Belt Buckle Metallic cream... our next step! Step 4: Once the paint is dry, tap your brush lightly into the metallic cream, then dab it onto a paper towel. Once your base grey paint color is dry, it's time to add a little shimmering contrast! With this step, less is more. You should dab enough off paint onto the paper towel so that your paint brush has barely any product on it. Use long and light brush strokes to dry brush the metallic cream over the paint. Apply light pressure at first. You can apply more pressure if needed. The metallic cream should appear feathery looking instead of one solid stroke of cream. If you put too much on in one spot it's ok! Simply add a little more paint to another paint brush and dry brush over the problem area and blend. Continue to layer until you get the desired look. 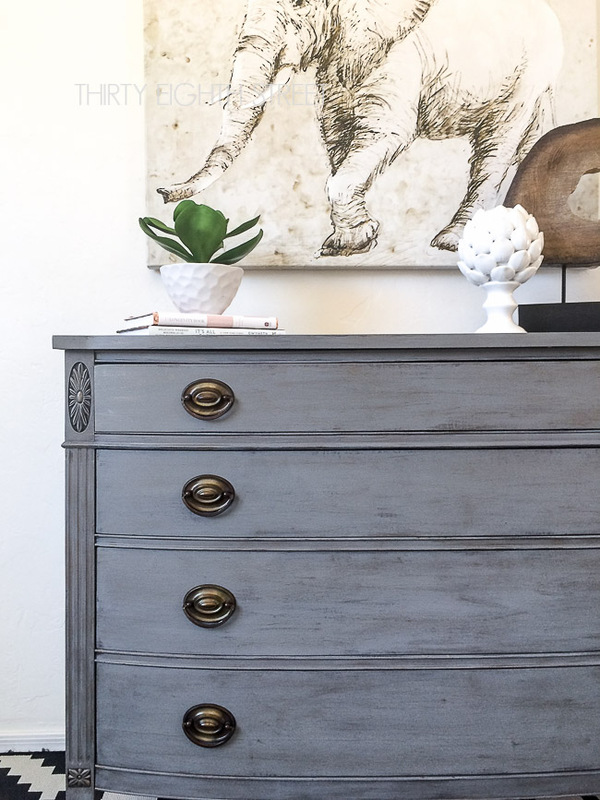 The combination of the grey paint and the metallic cream gives your furniture a nice dirty worn finish that resembles Restoration Hardware's zinc furniture collection. Step 5: Protect your piece with a top coat of your choice. 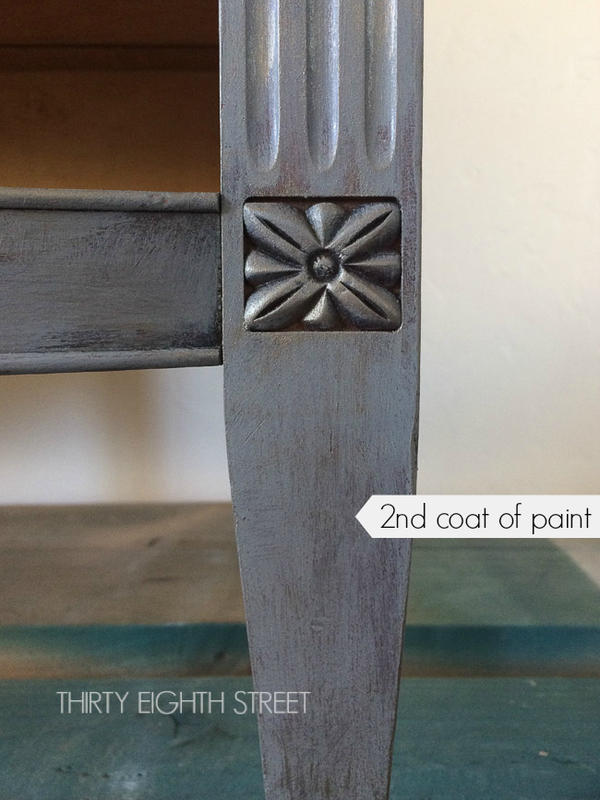 The last step to getting your Restoration Hardware furniture finish is to apply your topcoat! If you like the look of this layered zinc finish, go for it! 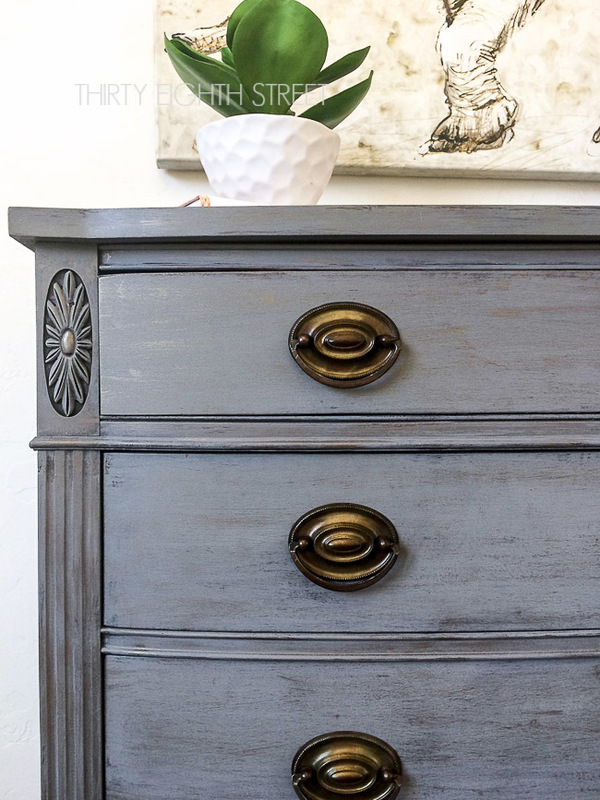 One Kings Lane Dresser Knockoff tutorial. You can save this tutorial for later by PINNING IT HERE! Wow! Wow! Wow!! I am in love with this piece!!! Gorgeous, you did a fabulous job. I can't wait to try it. Thank you, Jessica... 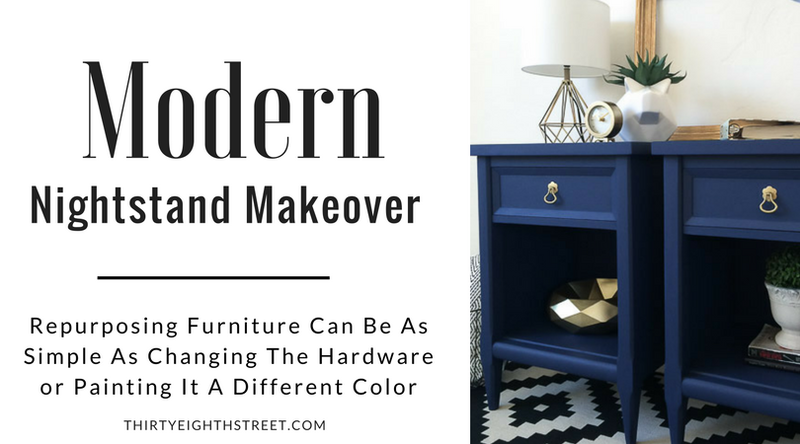 It was such a fun furniture makeover! Good luck with your project! Well good, I'm glad the directions made sense! It's always a challenge to try and explain something in type vs actually showing how to do it live. Hope you have a great weekend! This is gorgeus! I love it! Thanks for sharing:D I should definately try this creem! Thank you... You'll love the Country Chic Paint's metallic cream, it's amazing! Fantastic job! This is gorgeous! What a beautiful makeover! Love this piece! what an amazing transformation!!! I have a dresser that looks just like the original that may be getting a makeover soon! thanks for sharing!!! Love that style! 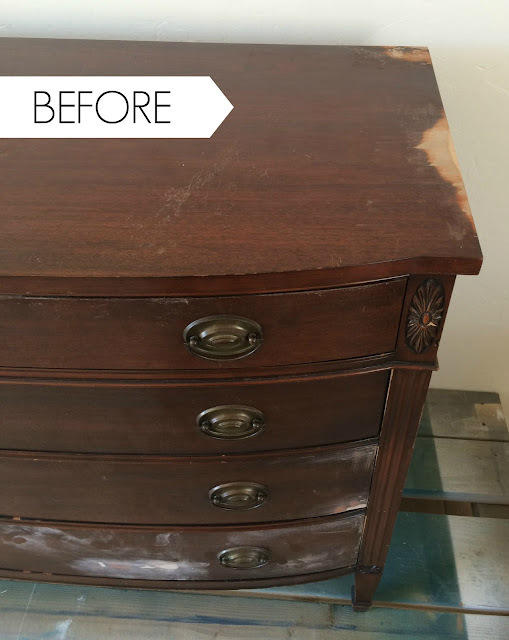 Sending good vibes over to your dresser makeover! This piece is really beautiful and your technique is so cool! Thanks for linking up with our Merry Monday party this week! Nice job Carrie! I love the color! Thanks for sharing at Welcome Home Wednesdays! You're a feature this week. Yay! Erin- I'm glad you that you enjoyed it! Thanks so much for sharing our work! Really gorgeous. Over from W H W today and clicking around as usual! Thank you. A stunner for sure Carrie! The metallic paint really takes it to another level. I would even say it is better than Restoration Hardware because it is a solid piece of furniture. Great job! Pinning and sharing. Thanks, Mary! Isn't the metallic cream amazing? Such a difference! Love how it turned out Carrie and a fabulous tutorial too. Thanks for sharing this at Shabbilicious Friday. I'm delighted to be featuring it at tomorrow's party and pinning. 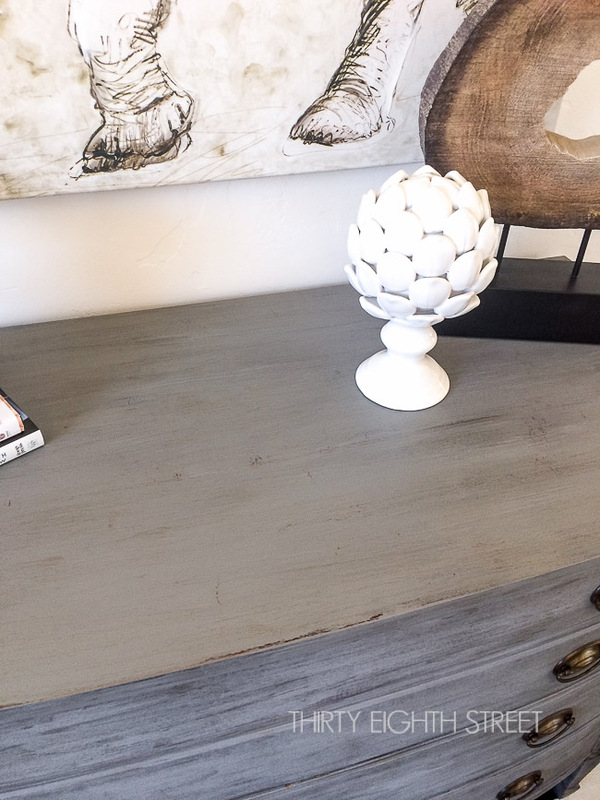 Thank you for sharing our dresser this week, Kerryanne! I love the finish on this and it is such an amazing transformation! Thank you, Mary! Doesn't the metallic cream add something special? Thank you for sharing our dresser, Kathryn! Amazing work! Love it! Thanks for sharing!! Vesna, I'm glad you liked it! I’m worried about painting without priming the furniture first. Thoughts? Hi Jamie! Great question! Priming your furniture first will never hurt it. What paint line are you planning to use? In 90% of my furniture makeovers, I never prime first. But, there have been occasions when the furniture I'm working on has had an oily substance soaked into the wood that causes bleed through. If I'm painting a piece of furniture white, I almost always prime. If I've cleaned my furniture piece really well and I'm using a chalk based paint, I don't typically prime. If you're planning to use a latex paint- always clean, give it a light sanding and prime first! It really depends on the piece of the furniture you're working on and the type of paint you'll be using. I hope that helps! How much of each paint did you use to achieve this look? I’m looking to order the country chic paint to redo my entire bedroom set, it looks gorgeous! You really don't use very much paint for this look. Because you want the wood tones to peak through you are apply light coats and they are full coverage. I used two coats of Cobblestone on this size dresser and maybe used half of the jar? I barely made a dent in the Belt Buckle metallic cream. You could get by with one jar of Belt Buckle for your entire bedroom set and still have plenty left over. A little bit goes a long way! I would estimate that you'll use 1/2-3/4 jar of Cobblestone for your dresser depending on how big it is. 1/2 jar for a pair of nightstands. 1 jar for a headboard and bed frame depending on how massive it is, maybe less? I hope these estimates help!